A session of Haitian parliament was suspended tuesday after gunmen posing as former Haitian military surrounded the Haiti parliament building. 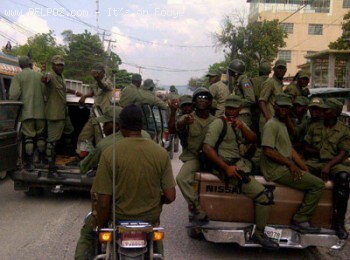 Haiti Armed Gunmen or Haitian Army? President of the Chamber of Deputies, Levaillant Louis-Jeune says: "It is intolerable that gunmen besiege parliament at work. ", he had to prematurely terminated the parlimentary session. These armed men who pose as members of Haiti's former army had taken position in front of parliament to demand the return of the Armed Forces of Haiti. The scenario could have been a lot worse, people. So far those gunmen have more or less acted minimally. Imagine a country like Haiti with an absentee, presumably sick president with no prime minister to take control of the country, a defunct prime minister of whom nobody accepts orders from, an unprepared, under funded and under armed police force. Sergo Jean, Moin gan pre 2 zan map di parol sa-a sou blog belpolitik. KONSTITISYON SA-A PA BON. Li fe ampil division nan gran fami haitienne. Diaspora due kampe ak Lame-a tet kale, bali tou't kalite sipow. Tout sa nou we cap pase la an Haiti, mwen cre tout mounn sa yo gen rezon paske constitution ayisyen an bay tout dwa pou yo ecxiste. Palmante yo gen dwa paske yo toujou di yo legal selon constitution an et mwen cre tou milite yo gen dwa paske constitution an bayo dwa tou antan ke institution d'eta an Haiti. Si palman pat vle pou l'armee te exziste se pou yo te retire l nan constitution an le yo tap fe amandman ladan l, men se pat sa ki te interese yo se pou yo te ka ajoute temps sou manda yo epi declare yon premye minis ka ranplase prezidan la republic la o lie ke yo di foc peyi a gen yon vice prezidan ki pou pase nan elecsyon ansanm avec prezidan pou si yon bagay rive prezidan pou yo pa bezwen al kouri fe elecsyon cote vice prezidan ka fe res temps sou pouvoi, min yo te we se premye minis paske si yo pa gen nan elecsyon yo pral bay kou d'eta avec premye minis le prezidan pa gen majorite nan la chanb.